Manoir de Rose in La Jolla is reminiscent of a French country manor home. Complete with a lovely pool and spa in the backyard, this magnificent home is the newest addition to Nancy's hand-chosen list of San Diego Vacation Rentals. We're excited to offer this 4 bedroom, 3 bath single family home with central AC, a beautiful backyard with pool (please note - there is an additional charge of $75 per day if pool heater is used so please request this in advance or add it to your online reservation) , hot tub, and outdoor living area. It's in a quiet residential neighborhood on the hill right above La Jolla Shores with a magnificent view of La Jolla peninsula jutting out into the Pacific Ocean and fabulous sunsets. The house is set back from the street surrounded by a wrought iron gate and a green lawn. Step into the entry with it's vaulted ceilings and crystal chandelier and "Rose," the mistress of the house, is there to welcome you. The original was sculpted by Rodin and Rose was the love of his life. Turn left into the spacious living room where the gas log fireplace lends a cheerful glow to the large seating area. Directly off the living room is the formal dining area with seating for eight. The dining area leads into the fully-equipped kitchen where any home chef will find everything he or she needs to prepare meals while keeping an eye out for the kids in the pool. Just off the kitchen is the casual family room where you can watch one of 45 premium movie channels including HBO, Cinemax, Showtime, STARZ, ENCORE) over 300 premium TV channels (11 in Spanish) or enjoy your favorite sports team with 40 regional sports networks on the 55 inch flat-screen TV. And stay in touch with high speed internet (50/5 Mbps) and unlimited Phone Service to the U.S., Canada, Mexico, China, Hong Kong, India, The EU (28 countries), Norway and U.S. territories. Listen to your favorite music with 75 satellite radio channels. There is one queen bedroom with a 48 inch TV and DVR and one full bathroom with a shower on the main floor for family members who may not want to climb stairs. An elegant stairway leads up to the library which has a pull out queen sofa-bed for an occasional guest, a lovely canyon view and a chess/checkers table. There are two master bedrooms off the central library, each with a King sized bed and 48 inch TV plus a view of the ocean and La Jolla peninsula. One master bedroom has a skylight to watch the stars while the other one has a sliding glass door out to the rooftop deck to enjoy the morning sun. The third bedroom upstairs has a queen bed and 48 inch TV. The rooftop deck has three very comfortable lounge chairs with an umbrella, and a table for 6 (8 chairs) with an umbrella. Take the stairway down to the backyard and you will find a sun room with wall to wall windows, a ping pong table, a game table, and a chaise lounge and canopy bed for an afternoon nap! There are two outdoor tables with 10 chairs under the pergola by the pool. The large two car garage has a washer and dryer, back pack style beach chairs, a cooler, body boards, and beach umbrellas. 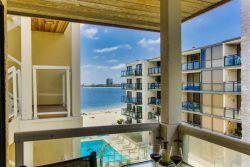 You are only 1.2 miles right down the hill from 'La Jolla Shores Park with it's ample parking , restrooms and white sand beaches. You'll find delightful shops and restaurants in La Jolla shores, also. 10-14 miles to Old Town San Diego, Airport, Amtrack, GasLamp District, Embarcadero, Zoo, Balboa Park. 21-29 miles to the flower fields of Carlsbad, LegoLand and the Wild Animal Safari Park. This is the perfect place for your family or friends to enjoy being together on vacation and build memories to last a lifetime. Unlimited Phone Service to the U.S., Canada, Mexico, China, Hong Kong, India, The EU (28 countries), Norway and U.S. territories. Nancy and her team were very helpful and accommodating. Our family had a wonderful vacation in this home. It provided us with a lot of very comfortable space to spend time together celebrating the holidays.